If you've never heard of an instrument called the "Rhythmicon", let alone a virtual one, your ears are about to get a treat. Conceived and built in 1931 by musical forward-thinkers Leon Theremin and Henry Cowell, the Rhythmicon was a musical keyboard instrument. Each key played a repeated tone, proportional in pitch and rhythm to the overtone series (the second key played twice as high and twice as fast as the first key. The third key played three times higher, etc.). The online one (made by Nick Didkovsky, of Dr. Nerve fame, in 2003) does all that and more, just without the whirring optical disc mechanism inside the wooden cabinet. If it sounds too nerdy, fear not, the results are anything but. 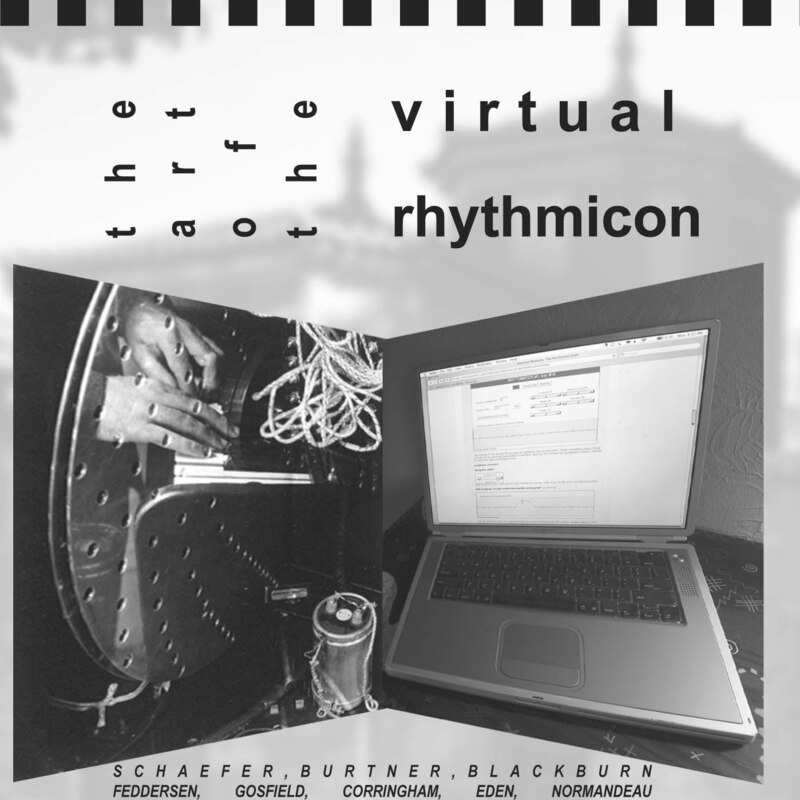 In the hands of some of today’s leading sound-artist/composers, the Virtual Rhythmicon makes music that shimmers, pulses, and haunts with a beauty that would get even microscopic cells grooving with delight. Today, the Theremin (the Rhythmicon’s more famous cousin) is part of pop consciousness... if this CD is any indication, the Rhythmicon will join it there soon! It was Nick "Doctor Nerve" Didkovsky who in fact handled the programming, but he's not one of the artists featured here: Janek Schaefer, Annie Gosfeld, Innova head honcho Philip Blackburn, Jeff Feddersen, Matthew Burtner, Viv Corringham, Mark Eden and Robert Normandeau. Schaefer reroutes the Rhythmicon through FX pedals to generate a dreamy Ambient haze (despite its title All Bombing Is Terrorism), and Gosfeld contributes the distinctly metallic A Sideways Glance from an Electric Eye, while Blackburn's Henry and Mimi at the Y reworks Couper's 1925 Xanadu into an eerie spectral etude, exposing the inner workings of the Rhythmicon as thoroughly as [Couper did with her pianos]. There's little information provided on how sound artist and eco-technology pioneer Feddersen created This Time I Want Them All, but his website fddrsn.net is worth a visit; meanwhile Matthew Burtner provides copious notes explaining the mathematical ratios he uses in his two pristine "machine lullabies" Spectral for 0 and Spectral for 60. Viv Corringham's Eggcup, Teapot, Rhythmicon uses everyday objects (including, presumably, eggcups and teapots) as vocal resonators, Mark Eden's Cremation Science is a snappy Pop Art collage complete with science lecture and samples of, amongst other things, West Side Story, and proceedings end with a serious plea for religious tolerance in the form of Normandeau's Chorus, dedicated to the victims of September 11th 2001. It's a colourful and entertaining selection of pieces in keeping with the eclecticism associated with Innova's earlier Sonic Circuits compilations. I just simply wanted to express how impressed I am by this compilation CD - some very strong and quite outstanding work featured on there, so well done! The Normandeau piece is amazing! The Rhythmicon was a device developed in 1931 by Henry Cowell and Leon Theremin, and updated in a online version by Nick Didkovsky in 2003. Several composers were invited to write for the online version, and the result is a compilation that is rich in color and sonically tasty. The Rhythmicon plays loops of three keys, each higher in pitch and rhythm to its predecessor. Yeah, but does it make good music? Yes. This is no experiment for its own sake; the resulting works here are varied in passion and intent, and as with most good music, the composition is more important and impressive than the technology. Especially effective are Janek Schaefer’s “All Bombing is Terrorism,” a long contemplative piece, and “A Sideway’s Glance from an Electric Eye” by Annie Gosfield, which reaches back into Modernism and updates its playfulness with moody cello samples. Jeff Fedderson’s “This Time I Want Them All” is based on Cowell’s “The Banshee,” and makes good use of that track’s focus on disjointed, unpredictable inner workings of exposed instruments. Likewise, Mark Eden’s “Cremation Science” also looks to the hidden machinery inside instrumentation for its rhythms, which end up reminding one of the internal boiling of the creative artist. If for no other reason, you should buy this album for the sake of hearing a fascinating noisemaker and a key moment in the history of electronic music. But you should also buy this album because it’s a beautifully soothing and powerfully emotive collection of ambient experimental noise tone-poems. Supported by important arts foundations and grounded in lots of theory and academia, this album is arguably a must have for those of us who like to drop old-skool-experimental names like Theremin, Cowell, or Ives into our conversations.